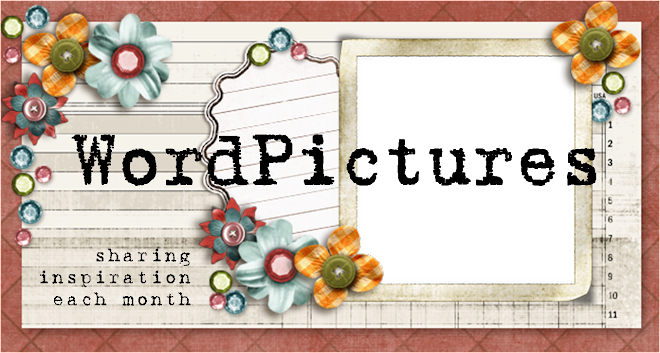 Word Picture Scrapping is where you create a layout by description only. You will rely on your your ability to interpret the written word. Creatitivity is the name of the game. Join us on the first Friday of the Month where we will put up a description of a layout. Interpret the description as you like and create a page. Send in an e-mail with a photo of your page by the last day of the month. All pages will be uploaded and a winner will be picked by our team of judges in the following week. Winners will be announced by the 7th day of the following month. For this example I will add comments in red to let you know some extra information - this will not be shown on the actual challenges when they start. 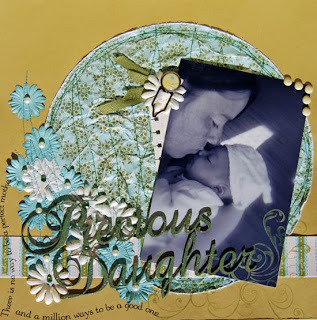 Place your photo on the side of the circle that is closest to the edge of the cardstock. Stick you photo down on an angle. Do not stick the centre edge of your photo down completely as you will need to slip hidden journaling in under the photo. Write your Journaling on your note paper and then place it under your photo. E-mail it in to us. Our sample layouts will not go up until after the directions have been up a week - that way we get to see how you interpret the directions and not use our layouts a visual aide. For this first sample one we have uploaded a layout so that you can see how the word picture can be interpeted. So that is how Scrapping Word Picture works - it is easier to do than to describe and it is a lot of fun. See you all on the First Friday of April. We are hoping to get a few sponsers for the monthly challenges so that we can give the monthly winner a fantastic prize. If you are interested in donating a prize we will offer your free advertising on the blog for the month of your donation and a perminate link to your site. Please e-mail and let us know. Thanks.